her head to look like Hank, I suspect. Greater love hath no woman. From our vantage point they looked like two eggs, sunny side up. The lady’s scalp featured a tattoo—not too big, nothing too blatant, you realize—jes’ a simple ol’ garden variety tattoo atop her bald head. troops. Between takes the Masai were a jovial group, laughing and singing, one haunting melody in particular. I went about humming it, praising it, couldn’t shake it. At movie’s end, I return to the scene of the carnage and stand before a monument to my fallen brothers. Before the director yelled “Action!” I asked the Masais standing about if they might provide on-the-spot mood music for me by singing their lovely melody one more time. They did, the camera rolled, and I felt the moment deeply. 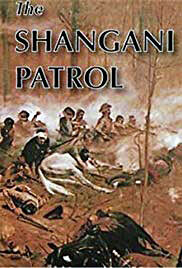 What a thrill for me to finally see “Shangani Patrol” stateside. The composer had incorporated the beautiful Masai melody into “Shangani Patrol”’s main theme! Meanwhile, back at the prep school that night, I was the only Yank there. The headmaster took the floor to give us a hearty welcome. Then, with a slight glint, he told us a tale: “Thousands of years ago, Noah, doing God’s bidding, built a rather large boat and crammed it with two each of God’s creatures and set off on the flood’s tide. Near journey’s end, the big boat was even more crowded with excrement. Or, as Noah put it, ‘Whew!’ He ordered the crew to dump this giant collection overboard. So they did, resulting in the biggest splash in history up to that time. This huge, huge mass gathered itself and floated off, beyond the blue horizon. It wasn’t seen again until it was discovered in 1492.” The laughter that followed was massive, just like that floating continent of crud. I wrote back to the chap and recounted that night. The chap knows a lady who worked extra on “Shangani Patrol” He gave her my address and she wrote me, requesting a DVD of “Shangani”. I remember her well, all gussied-up in the full fashion of the 1890s. All in blue she was, with a parasol. She now lives in South Africa. I’ll send her the DVD. As I write, I can hear that Masai melody in my mind. The lady in blue is now a grandmother, and I’m an old character, living in the land that was discovered in 1492.